According to Ayurveda, kitchadi is a therapeutic food that detoxifies the entire system, while kindling the body’s digestive fires called ‘agni.’ Following an exclusive diet of kichadi with the addition of some steamed seasonal vegetables and fresh fruits and perhaps a few tablespoons of yogurt midday, supplies all the bodies’ nutritional needs and will cause no nutritional deficiencies.One should follow a kitchadi diet when they want the digestive system to rest or when the body is fighting a virus or sickness. While the traditional kitchadi is made with white basmati rice I have used barley as the grain.Right now i’m in a good health so barley serves my purpose of maintaining digestive health. 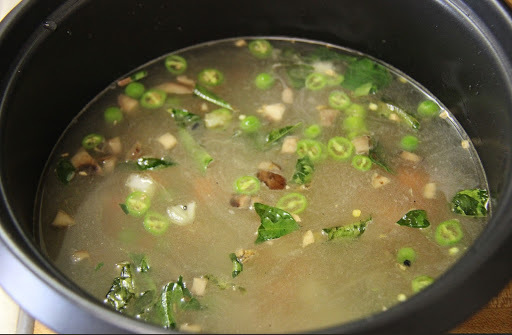 Try eating kitchadi for atleast 2 meals in a week.Barley has lots of fiber and is known to give the intestinal health a boost. It is a low glycemic index food so it works perfectly for diabetics. 1 cup of vegetables of your choice. (I used carrots, peas, onion and mushrooms).Do not use garlic or onion while recovering from sickness as they generate heat in the body. 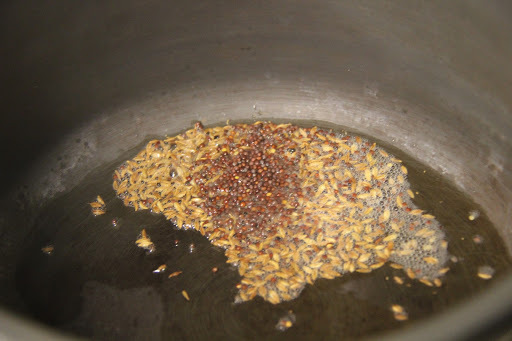 1.In a pan heat the ghee on medium flame and add cumin and mustard seeds roast until mustard splutters. 2.Add ginger pieces then roast. 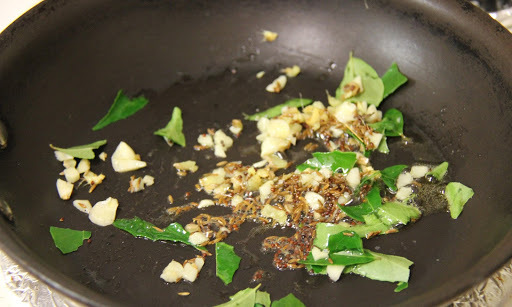 (I added curry leaves and garlic). 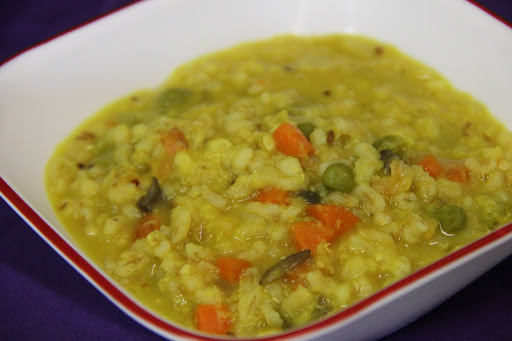 3.In a rice cooker take the barley and the moong dal and add 10 cups of water and salt.Add all your chopped vegetables and roast for 2-3 minutes.Add the roasted vegetables to it,asafoetida, turmeric, cumin powder and dhaniya powder and cook the mixture in the rice cooker. Add additional water if necessary. 1.You can squeeze a squirts of lime and add some chopped cilantro before serving. 2.Do not use garlic or onion while recovering from sickness they generate heat in the body that does not help recovery. 3.Do not use any other oils,meats,chili powder or brown rice because they are hard to digest in the stomach.